Round 14: ABC Supply 500 at Pocono, Long Pond, PA. August 18-19. After a three week break, the 2018 IndyCar season resumes at Pocono Raceway. The Tricky Trangle as it has become known, was founded by Joe 'Doc' Mattioli, a Philadelphia dentist turned successful property businessman. 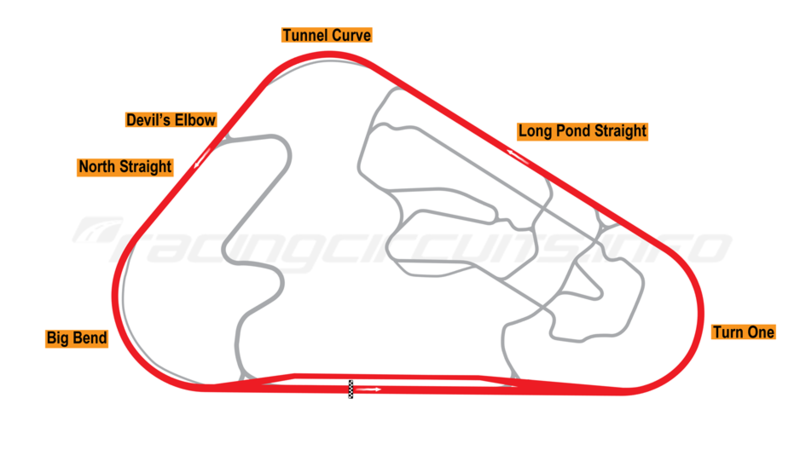 At first Pocono Raceway comprised a three-quarter mile oval and a drag strip, which later doubled as the main straight for the full 2.5-mile 'tri-oval'. A 1.8-mile road course was added in 1969 and in early 1970 the work on the full sized oval was started. The Pocono 500 was first held on July 3, 1971 and was won by Mark Donohue for Penske Racing, driving a McLaren M16-Offenhauser. The race was part of the USAC National Championship Trail and part of USAC's "Triple Crown", comprising the Indianapolis 500, Pocono 500, and California 500. After the CART/USAC split, the race became a CART event from 1982 - 1989. However, it was dropped, mainly due to the increasingly rough track surface as well as poor safety features, like the lack of run off areas and catch fencing. After a 23-year hiatus, the IZOD IndyCar series successfully revived the race in 2013, including the "Triple Crown". It adopted the 1971–80 USAC format, with the Indianapolis 500 in May, the Pocono IndyCar 400 in July. The MAVTV 500 in October at Fontana, replaced the original California 500 held at Ontario, as the venue longer existed. In 2014 the race returned to it's original distance of 500 miles and is the fastest 500 mile race in IndyCar history, with an average speed of 202.402 mph (325.734 km/h) and was the first 500-mile race to be completed in under 2 hours and 30 minutes. However, with the MAVTV 500 being dropped after the 2015 season, the "Triple Crown" is no longer contested. Triple Crown: Al Unser Sr., 1978. The driver with the most wins, A.J. Foyt: 1973, 1975, 1979, 1980. The team with the most wins, Team Penske: 1971, 1977, 1980, 1982, 1985, 1987, 1989, 2014, 2016. The track has unique layout and its three turns, are each based on turns from 3 other tracks. Turn One, with 14 degree banking, is based on the now defunct Trenton Speedway. Turn Two, also known as "The Tunnel turn", is like Indianapolis Motor Speedway, with 9 degree banking and Turn 3 has 6 degree banking, similar to The Milwaukee Mile. Original 1969 layout: 3/4 Mile oval, with the road course in grey. July 5th, 2014. 40.1929, 223.871 mph (360.285 km/h). Qualifying was marred by two major accidents. Castroneves crashed heavily at Turn 1 on his qualifying attempt, relegating him to a 20th on the grid. Later in the session, Hunter-Reay crashed heavily in Turn 3, then made further contact with the inside wall on the front stretch. He suffered hip and leg injuries in the incident and was transported to Lehigh Valley Hospital for examination. He was cleared to drive the following day but was forced to start in 21st due to his accident. Sato took pole but at the start of the race Kanaan launched into the lead with Rossi taking up second place. Sato, however, began to quickly drop through the field. Several drivers who started farther back in the field, including Dixon, Newgarden and Castroneves, began to work their way forward quickly in the opening laps. At the front of the field, the lead changed on Lap 12, as Rossi passed Kanaan. 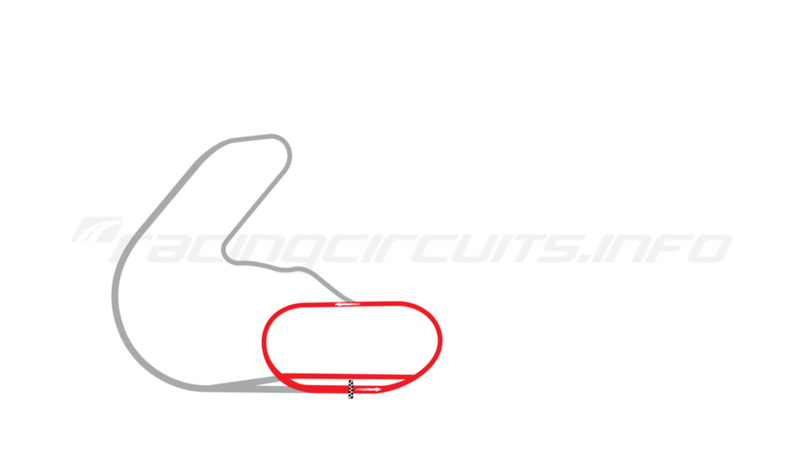 On Lap 23, the first caution period occured, after Gutiérrez made contact with the wall at Turn 3, causing parts of his rear wing to break off and land on the track. Gutiérrez was forced to retire due to the damage sustained in the incident. During the caution, drivers took the opportunity to make their first round of pit stops, with Rossi retaining the lead but now with Power running second, Kanaan third and Dixon fourth. During the stops, Max Chilton lost several laps after suffering from a turbo-wastegate issue that required repairing. The restart came on Lap 27, with Kanaan managing to sweep back into the lead, while Power moved into second. Rossi struggled on the restart and by the end of two laps had fallen down to sixth place. On Lap 30, the lead of the race changed hands again, as Dixon moved to the front of the field. With roughly 50 laps in, Dixon remained in the lead but the order behind continued to shuffle as Rossi moved up to second, with Hinchcliffe and Newgarden moveing into the top five. The first round of Green flag pit stops came around Lap 55, with the top five remaining largely unchanged. On lap 60, Rossi briefly took the lead, before being passed again by Dixon five laps later. Behind them, Power began to rapidly fall down the field, as the snap-adjuster on his front wing broke. Power eventually had to stop to have this fixed, putting him one lap down. Meanwhile Up front, the battle for the lead saw Hinchcliffe come into contention, as he, Dixon and Rossi exchanged the lead several times over the next several laps. The second round of green flag pit stops came and went but Hinchcliffe dropped well down the order after overshooting his pit stall. Hunter-Reay took the lead, despite his injuries sustained during qualifying. This battle continued up until Lap 116, with the third round of green flag pit stops. However, midway through the cycle, Saavedra made contact with the Turn 2 wall, bringing out another caution. Several drivers, including Newgarden and Castroneves, were caught out and forced to pit when everyone else had already made their stops. After the stops, Hunter-Reay led Rahal, Kanaan, Dixon, and Rossi. During the yellow flag, Power was able to get back onto the lead lap and not pitting during the caution. Racing resumed on Lap 122, with both Rahal and Kanaan passing Hunter-Reay, moving Rahal into the lead, the next lap, Kanaan took the lead. Behind them caution flew again, as Hinchcliffe and J. R. Hildebrand tangled in Turn 1. During the caution, Power pitted again, partly to repair damage sustained while attempting to avoid the incident and partly to top off on fuel. Kanaan and Rahal continued out in front. Racing resumed on Lap 132, with Rahal passed Kanaan for the lead. This began a battle between the two that saw them exchange the lead nearly every lap through to Lap 150. Many of the leaders pitted at this point, giving Power the lead. After his pit stop on Lap 161, Power maintained the lead. One more round of pit stops remained, with Power emerging back out in front, while Newgarden and Rossi in hot pursuit. However, Rossi suffered a broken fuel-nob, forcing him to remain in full fuel-saving mode, while Power and Newgarden went on ahead. In the closing laps, Newgarden managed to catch up to Power and attempedt to pass him but eventually ran out of time, allowing Power to take his second consecutive win at Pocono. Rossi held onto third place, while the top five was rounded up by Pagenaud and Kanaan. Scott Dixon, who had led the most laps of the race, finished sixth. Post race it was revealed that relations between Chip Ganassi Racing and driver Max Chilton had become heated, after he was parked by the team after completing only 129 laps of the race, while the car was three laps down, Chilton expressed his annoyance over the radio. Daly keeps Harding seat for Pocono. Last edited by bjohnsonsmith; 16 Aug 2018 at 05:09. The Tricky Triangle is my favorite oval in the world. It's great that it is on the Indycar schedule since I cut Nascar from my life. It used to love it because it is a pure horsepower track, but even though that era is gone its weirdness still shines through today. Last year's winner Power, takes pole equaling A.J. Foyt's 53 poles. Joesf Newgarden completes the Penske front row shut out. Wickens continues to impress with 6th. However, not such a good result for championship leader Dixon, who is 13th. I expected better times from Dixon Kanaan and Carpenter. Equalling Foyts pole stats is a really big result for this year's Indy 500 winner Power. Hats off to him. Has anyone got a feed? I can't get a thing. That was an ugly ctash. Don't like to be a downer on this, but this looks bad. REALLY bad. That was a horrific accident. Just got a feed and the race has been red flagged on the first lap, as Wickens apparently touched the left rear of R-HR. Watching the replay, it was an horrendous accident as Wickens was launched into the catch fencing, landing back on the track. R-HR is fine but no news on Wickens.